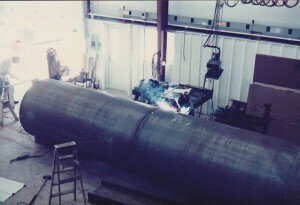 At Barnes Manufacturing no project is too big or daunting, not even a 240-foot tall smoke stack liner. When this project was presented to us the smoke stack was in rough shape, the inside of the stack was crumbling rapidly due to many years of wear and tear created by the hot flue gasses. 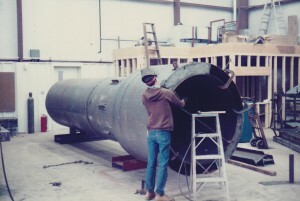 We at Barnes Manufacturing were tasked with creating a way to both eliminate future erosion as well as provide structural support for the vintage smoke stack. 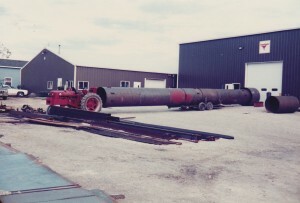 One of the major obstacles of this project was the shear size of the job, not only would it be near impossible to fit the whole stack in our shop, shipping it complete would have been an even tougher task. So we devised a plan to fabricate the stack in multiple sections for ease of delivery. Upon the insertion of the Carbon Steel Liner, the Smoke Stack was returned to full utilization and the Historic Vintage Icon was preserved. At Barnes Manufacturing our goal is to help solve manufacturing and engineering problems no matter the size. We accomplish this by coupling innovative techniques with our discriminatingly high quality standards. This has allowed us to work within many industries over our nearly 40 years of existence. When you’re thinking BIG think Barnes Manufacturing.